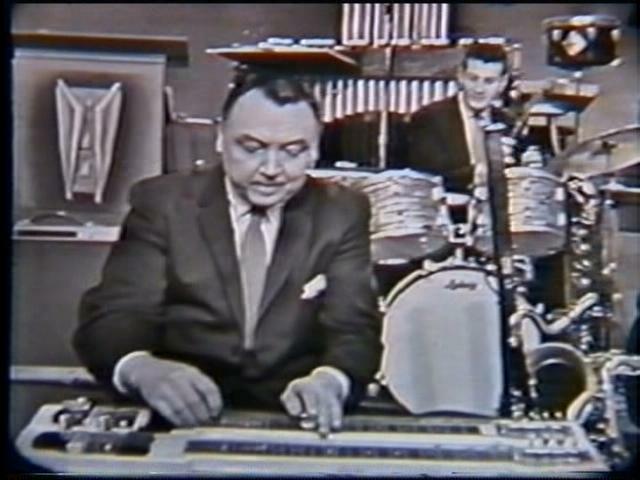 Alvino Rey was a pedal steel guitar player on the Lawrence Welk Show in 1959. Rey was born in 1911 in Oakland, CA and moved to Cleveland, Ohio at the age of ten. At the age of 10, Rey began studying guitar and listening to the likes of Eddie Lang and Roy Smeck. At age 15, he invented an electrical amplifier for the guitar and went professional. He worked with a number of bands including Russ Morgan, Freddy Martin and Horace Heidt. In 1937, he met and married one of the King Sisters, Louise King. Heidt fired the King Sisters from a mutual engagement they were performing during an engagement in New York when a microphone fell down and hit a patron. Rey also quit and formed his own band with the King Sisters as vocalists. In 1942, they recorded the hit song with "Deep in the heart of Texas." Among some of the unknown future greats to perform in his band were Ray Conniff, Neal Hefti, Billy May, Al Cohn, Johnny Mandel and Zoot Sims. Rey retired in Salt Lake City, Utah and passed away of congestive heart failure in 2004.